Now a day the most dangerous disease is AIDS which is caused by HIV virus. There is no total cure for this disease only precaution. The abbreviation for HIV is Human Immunodeficiency Virus. HIV attacks to the human body immune system. Basically the immune system produces white blood cells and antibodies that attack viruses and bacteria. The infecting cells are called T-cell lymphocytes. 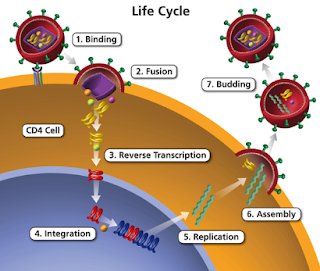 From many days if a person is infected with HIV, the virus destroys all the T-cell lymphocytes. Then the virus disables the immune system to defend the body against diseases and tumors. The current worldwide expansion of the AIDS epidemic is mainly driven by the sexual transmission of Human Immunodeficiency Virus and its future will be determined mostly by the degree to which sexual transmission can be reduced. Although sexual transmission among homosexual males is still a significant part of epidemic spread, in the most populous regions of the world, sexual transmission among heterosexuals is the major mode of spread. Transmission of Human Immunodeficiency Virus among injection drug users occurs primarily through HIV infected blood contamination of injection paraphernalia, which is re-used by an uninfected injection drug users. Behaviors that improve the likelihood, frequency, and magnitude of exposure to infected blood increase the risk of infection. Among injection drug users, several demographic and behavioral characteristics are associated with greater risk of acquiring HIV. Transmission of Human Immunodeficiency Virus -1 and some other viruses can occur following transfusion of a blood product derived from an infected person's blood and processed into a blood component. Human Immunodeficiency Virus has been passed through transplantation of kidney, liver, heart, pancreas, bone, and skin: all blood containing organs or highly vascular tissues. There are no reports of Human Immunodeficiency Virus tissue transmission from HIV-seropositive donors of cornea, ethanol treated and lyophilized bone, fresh frozen bone without marrow, lyophilized tendon or fascia, or lyophilized and irradiated dura mater. Both intrauterine insemination and cervical insemination result in HIV transmission. Perinatal transmission of Human Immunodeficiency Virus accounts for virtually all new HIV infections in children. The relative contributions of in utero and intrapartum HIV transmission are unidentified. One proposed scheme for differentiating these 2 modes of transmission suggests that the virus was transmitted early or in utero if Human Immunodeficiency Virus is detected in the infant within the first 48 hours of live. Testing serum for antibodies to Human Immunodeficiency Virus with a standard ELISA (followed by a confirmatory Western Blot) is currently the most typical, cost effective, and accurate method of screening for infection. Rapid serum HIV antibody tests, saliva- and urine- based antibody tests, and home Human Immunodeficiency Virus antibody testing kits have been approved by the Food and Drug Administration (FDA) and are being marketed. Human Immunodeficiency Virus RNA tests are being used in research and clinical settings to diagnose primary HIV infection before the formation of noticeable antibodies. Fever: The fever can last from a few days to longer than a month, with no other symptoms or disease present and no other obvious cause. This is the most important aspect in Science daily life. Wasting: A weight loss of at least 10% in the presence of diarrhea or chronic weakness and documented fever for at least 30 days that is not attributable to a concurrent condition other than HIV infection itself. Everyone should be very careful about this disease and all should aware of Human Immunodeficiency Virus knowledge. This is the dangerous disease that cannot be cure.